Rafting the Grand Canyon was a very rewarding experience. This section near Lower Saddle Campsite was particularly rewarding at night, with views up the canyon and into the stars above. I was so in awe of nature here. This photograph showcases almost a full 360 degree view from canyon wall to canyon wall - I photographed it from the shore of the Colorado River. The Milky Way arc above the canyon walls in complete darkness - there was no other light source available here. 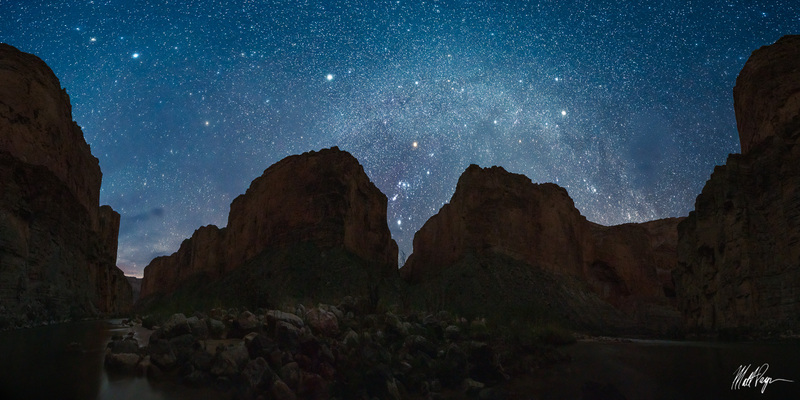 The constellation of Orion's Belt can be seen in between the two canyons at center.